Perfectly designed : these beautiful villas have been thoughtfully designed to provide the perfect individual private contemporary living space, featuring double full glass sliding doors that open directly on to a large terrace with private swimming pool, enclosed gardens with off road parking. 'SUN ALL DAY' with the generous rooftop solarium with glorious views to the beaches and the golf course : Located in a new centralised zone with small tree lined park area to front and side. Perfectly located : These Villas are just 5 minutes from the popular beaches of Los Alcazares, the main high street and just 15 minutes from San Javier (Murcia) airport :The main plaza of Los Alcazares is a 15 minute walk with an array of banks, bars, bakery local tape's bars and international restaurants. Perfect for leisure : The promenade of Los Alcazares is an amazing place to ramble either in day or evening, with countless restaurants to choose from, and some great little tapas bars just by the sea, or the ever popular marina. This area offers a variety of sports activities, including seasonal water sports : With some particularly good golf courses very close by! 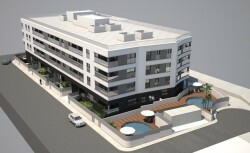 Pricing - The basic prices on phase I are from 219,950€. Turn Key Villa Packages - The turn key villa price : Includes everything as per our 2 show houses / Piloto's (lighting, white goods, blinds, furniture, pool cascade, out door summer kitchen, pergola, electric shutters) 259,950€ for the semi detached and the detached will be 319,950€ (prices for phase 1 release).